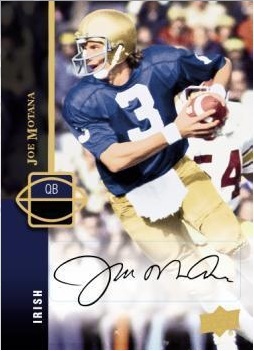 2014 Upper Deck Football has put the fun back in college football collecting. NCAA college uniforms and logos of all your favorite stars and draft picks. And, Johnny Manziel is up front with tons of inserts, parallels and subsets. Let's have a contest. Best (most valuable - Charlie decides) Upper Deck Johnny Manziel Autograph pulled in our store wins $100.00. Hobby boxes have THREE AUTOS per box and feature the return of interactive PREDICTOR inserts. These HOBBY ONLY interactive inserts offer collectors exclusive cards if the featured player is the first drafted at their position in the 2014 NFL Draft. Predictors are inserted 1:440. And, Sports Cards Plus is offering $100.00 to buy the first Johnny Manziel Predictor pulled in our store! The main part of the 2014 Upper Deck Football base set includes 50 base cards and 100 Star Rookies. From there, things get interesting. Star Rookies SP (cards 151 to 210) are inserted 1:12 while Star Rookies Rare (cards 211 to 251) are inserted 1:120. And, there are 25 Star Rookie Variations inserted 1:120 that have a different photo. Star Rookies also have autographed versions and base cards & Star Rookies have a Glossy parallel numbered to 10! UD Authentics Rookies are numbered to 575 and fall two per box and also have autographed versions. Rookie Letterman Signatures are the lone autographs in the product that are not parallels of another part of the set. These cards are varying numbered. Also included are College Tribute Patch Cards (4 per case), College Football Heros (2 per box with autographed versions more rare), and 1994 UD Tribute Veterans (2 per box). 2014 Upper Deck Football arrives Wednesday about 3 O'clock at Sports Cards Plus. So pick your 2014 Upper Deck Football Box from THE BEST CASES in the Hobby. Don't be the guy who says, "That could have been my picture." Come in Wednesday and have some fun!